For any gardener who wishes to grow their plants by using strict organic principles, modern fertilisers can often be a bit of a sticking point. However, help is at hand from the native European herb Comfrey – otherwise known as ‘Knitbone’ as it was once used as a traditional remedy to help heal broken bones. Comfrey has a naturally deep rooted and extensive root system that acts as a dynamic accumulator by extracting a wide range of nutrients from deep within the soil. These nutrients naturally accumulate within its fast growing leaves - up to 4-5 lbs per plant when cut. Rich in nitrogen, comfrey is also an excellent source of potassium - an essential plant nutrient needed for flower, seed and fruit production. In fact comfrey leaves contain 2-3 times more potassium than most farmyard manures. Making a liquid feed from comfrey is relatively simple. In fact, it can be no more difficult that adding comfrey leaves to a bucket of water. They will need to be weighed down to keep the leaves submerged, but wait 3 to 5 weeks – depending on how warm the weather is – and you will have a wonderfully rich liquid feed by the end of it. Although the comfrey solution is already mixed with water it is worth diluting it down further to prevent damage to the root systems of plants that it is applied to. Consider diluting the solution at a rate of one part concentrate to 3 parts water. Unfortunately, liquid fertilizer made from comfrey stinks to high heaven so you may wish to use a more sophisticated system for its production. 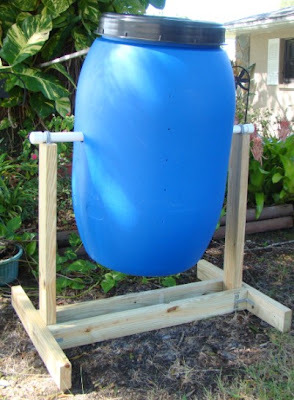 A small water barrel would be ideal as it will come with a lid (to keep the smell in) and a tap at the base so that the liquid fertilizer can be drained off when needed without the risk of splashing the foul smelling solution over yourself! TIP. Consider placing the leaves into an old sack before submerging as this can help to prevent taps from being blocked. Alternatively – and far cheaper than the cost of buying a water barrel – is to use any a large plastic container that comes with a lid. Drill a hole - ¾ inch in diameter - in the bottom of the container and then place it on a stack of bricks. Position a wide-neck bottle under the hole, and then after a couple of weeks you can expect to see a dark liquid trickle out of the container and into the bottle. Once collected, the liquid can be stored in a cool, dark place. The nutrients in this liquid are highly concentrated and will need to be diluted with water before it can be applied or it can damage the root systems of any plants you try to feed it to. The liquid must be treated as a concentrated liquid feed, so dilute it at a rate of one part concentrate to 10 parts water. This solution can be applied at every watering should you require.